Having criticized the generic term “The Mint” several times in the past few years for actions which were sometimes the fault of the Treasury Department or Congress or others, I thought it might be a good time for me to compliment the United States Mint proper for one of its generally successful numismatic programs, the Proof set. Although many of the commemorative coin and medal programs dumped in the lap of the U. S. Mint by a greedy and/or indifferent Congress since 1936 have proven to be less than wonderful, whether in marketing or design or purpose, the regular design Proof sets offered as superior examples of the coiner’s art have generally been considered to be a credit to the Mints that have struck them. Though some of the post-1967 sets have declined in value since they were originally sold, this is generally not the fault of the Mint, but rather the fault of speculators who overbuy an issue in the hopes it will prove scarce and then dump it on the market if it does not. The first of the three modern eras of Proof sets began in 1936, after a 20-year lapse allegedly caused by concern over the impending entry of the U.S. into World War I (which did not occur until April of 1917), but more likely brought on by collector dislike of the Matte Proof finishes used on certain coins of the 1908-1916 period and the technical difficulties involved in trying to “Proof,” or polish, the textured surfaces of the new 1916 silver coins. I have no idea why the 1916 Barber Dime and Quarter were not struck in brilliant Proof even if there were no plans to strike a 1916 Barber Half, but as sales of the silver Proof sets had fallen drastically in previous years (380 in 1914 and 450 in 1915) it may have been thought that they just weren’t worth the bother. The classical Proof set era begun with a bang in 1858 ended with a whimper in 1916 with only the Matte Proof Cent and Five Cents being offered to collectors, no regular issue gold coins being struck in Philadelphia in 1916 and hence no Proofs. Once the decision was made to stop making Proofs, bureaucratic inertia saw to it that the same policy was observed in the next year, and the next, etc. I have never seen a good reason given as to why the production of Proof coins was resumed in 1936, but it is possible that the commemorative coin frenzy which reached its peak in that year inspired the Mint to imitate the Post Office, which since 1934 had been making a tidy sum selling specially prepared souvenir sheets of otherwise regular design stamps to collectors. 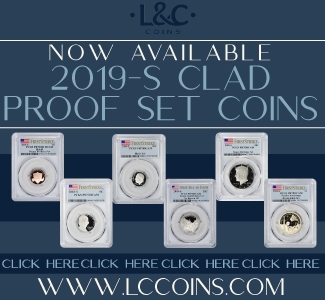 The earliest sets sold in 1936 lacked the brilliant finishes of the pre-1909 Cents, pre-1913 “Nickels” and pre-1916 silver coins, and it is generally believed that this was simply due to the Philadelphia Mint’s personnel having forgotten how to make brilliant-finish Proofs. 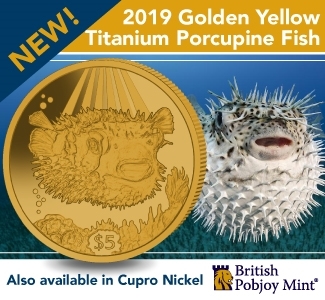 It is remotely possible that the dull finishes were the result of official indifference to what was considered to be just another money-making scheme until collector response, and criticism, forced the Mint to upgrade its product, but this is merely speculation on my part. The textured surfaces themselves, which were an integral part of the Fraser design for the 1913 Indian Head Five Cents and which were copied in a somewhat subdued fashion by A. A. Weinman for the 1916 Dime and Half, had long been lost to erosion and remodelling of the master dies and hubs for these coins. The Lincoln Cent design lent itself perfectly to brilliant Proofing, as did the relatively new (1932) Washington Quarter design. As was the case before 1916, the Proofs were sold both in sets and individually. The coins were placed in cellophane sleeves (which tended to get brittle and crack open with age) simply as a temporary shipping measure, although many people chose to leave the coins in the original packaging as though the holders actually meant something. The popular Lincoln Cent usually outsold the silver issues by about 50%, the modernistic (at that time) Washington Quarter usually being the poorest seller by just a small margin, with the new Jefferson Five Cents generating significant novelty interest in 1938 and outselling the Cent that one year. The sleeves were usually stapled together into sets for ease of packing and shipping, though they could be bundled together any other way that the customer ordered them. At Harlan Berk’s last year we purchased a run of 1938 to 1942 Proof sets from the son of their original purchaser, all in the original cellophanes with the original cardboard shipping boxes, plus two groups of ten each 1942 Cents and 1942-P Five Cents stapled together and placed in cardboard boxes just like the individual sets. The 1942 set in this group was the type one set with only the copper-nickel Five Cents piece, which may explain why the collector ordered the 1942-P coins after the wartime silver alloy was introduced on October 8th of that year. Strangely enough, this was not the last time that the Mint has offered one denomination in Proof apart from the regular sets. 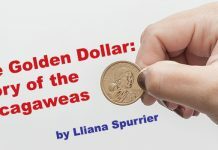 If the wartime demand for coins was the cause for suspending Proofs in 1942, then the reason they were not resumed until 1950 can only be that old bureaucratic standby, inertia. Domestic coinage demand fell after the war from 2.156 billion pieces in 1946 to only 645 million pieces in 1949, and the Philadelphia Mint actually shut down regular issue production for two months starting June 13, 1950, because of the lack of demand for coins. Apparently someone decided that making Proof sets would be a good outlet for part of this excess capacity, and so the second modern era began in 1950. According to the July, 1950, issue of “The Numismatist,” legislation which permitted the Mint to resume the manufacture of proof coins was passed on May 10th of that year, though I am not sure why such legislation would have been necessary and not simply an order from the Secretary of the Treasury. Perhaps politics was to blame–theoretically the Treasury Secretary has the lawful authority to change the designs of all of the current regular issue designs by decree, but lacks the political clout to do so and survive the second-guessing of others. 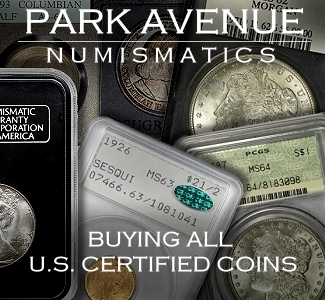 The August issue stated that the sets were placed on sale on July 17th at $2.10 each, the difference between the 91 cents face value and the selling price covering “the special work which is required for proofing the coins and for postage,” although no discount was given for sets purchased over the counter or in quantity. This question of excess postage charges built into the price of multiple sets was to be raised again in 1968. 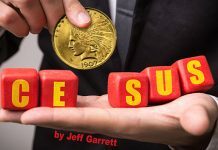 The article went on to state that the Mint was beginning sales with approximately 10,000 sets on hand, with a temporary limit of five sets per person until the expected initial rush of orders could be handled. Sales were good, perhaps due to the imaginary shortage suggested by the limit on sales, and a total of 51,386 sets were sold, roughly 2-1/2 times the number of 1942 sets. Once again the earliest production, probably the 10,000 sets mentioned above, lacked the brilliant finish of the previous proofs, though the quality of the coins improved after collector complaints. However, the packaging remained the cheap cellophane sleeves in a cardboard box of the pre-war sets, which was intended by the Mint simply as a safe way to mail the coins and nothing more. Rather than automatically removing the coins from the holders and placing them in their collections, as the Mint assumed the collectors would, most collectors carefully preserved the original packaging and even began paying a premium for unopened sets that they themselves would never look at! This unopened box mania collapsed after a few people discovered that the “unopened” sets they had bought on the secondary market had been steamed open and resealed and now contained steel washers of the approximate size and weight of the missing proof coins. Sales increased slowly over the first few years, and finally began to climb in 1954 under the personal care and promotion of the new Philadelphia Mint Superintendent Rae Biester, who sought to avoid a threatened round of layoffs by increasing Mint output via Proofs. Biester went so far as to write personal notes thanking buyers of the 1953 Proof sets, and inviting them and their friends to buy the 1954 and subsequent sets. Under Biester’s administration the packaging was improved by placing the coins between two sheets of plastic divided into pockets via a simple pressure bonding, which allowed the coins to be viewed and displayed without removing them from their original holders. These “flat packs” appeared in mid-1955, and this is the only year which is collected by holder variations (other than by product variations). Collectors approved of the change, and the million set mark was quickly reached as sales nearly doubled from 378,200 in 1955 to 669,384 sets in 1956 and nearly doubled again to 1,247,952 sets in 1957. This last figure was due in part to the Prudential Insurance Co. speculating in over 100,000 of the sets, the largest numismatic transaction up to that date, though they later changed their investment strategy and dumped the sets back onto the market, depressing the bid for them to less than issue price. The earliest 1960 sets contained the Small Date Cent, which in Uncirculated condition had ignited the B.U. roll market in particular and the U.S. coin market in general, and these sets quickly became worth five and ten times their issue price. Sales of Proof sets jumped from 1,691,602 in 1960 to just over three million for each of the next three years, setting the stage for the 1964 Kennedy Proof set and the suspension of Proof coin production. The growth of the coin-operated vending machine industry in the late 1950’s and early 1960’s caught the Mint, which had mothballed its most modern facility in San Francisco in 1955, completely by surprise, and the coin shortage caused by these machines was aggravated by widespread hoarding of the new Kennedy half in 1964 and the Mint’s devotion of more and more of its capacity to trying to meet this demand. Sales of the 1964 Proof set in the Fall of 1964, at the traditional price of $2.10, quickly reached the unheard-of level of 3,950,762 sets, at which point sales were discontinued and the prices for the sets on the secondary market shot up to $20 or more. Citing the need to convert its Proof coin capacity back to regular coin production, though perhaps piqued at the shameless profiteering in its product, the Treasury then announced that no Proof sets or Mint sets (one Uncirculated coin of each denomination struck at each Mint) would be issued in 1965 or for the foreseeable future. As a concession to collectors the Mint subsequently announced that it would issue “Special Mint Sets” containing one coin of each denomination at $4 per set, to be coined at the old San Francisco Mint reopened as the San Francisco Assay Office, but without Mint marks as those had been eliminated on coins dated after 1965 to discourage speculating in rolls and bags. The 1965 sets were packaged the same way as the 1964 Proof sets and were generally a bit above the quality of the 1964 Uncirculated sets, with the occasional coin showing evidence of the dies being polished before use. The 1966 and 1967 SMS sets were packaged in hard plastic holders purchased from the Whitman Coin Products division of Western Publishing and ultrasonically sealed, setting the stage for the fancier holders used when Proof set production officially resumed in 1968. The 1966 and 1967 SMS coins are neither fish nor fowl as to their status of Uncirculated vs. Specimen coins, as they show progressively better care in the polishing of the dies and the handling of the struck coins, and I have seen at least one 1967 SMS half with absolute ‘proof’ on it that it was struck twice in the press (namely a piece of lint with a distinctive pattern to it which was impressed into the surface in two slightly different locations). However, the Mint maintains that these are not Proof coins because they were not sold as Proof coins. No matter. 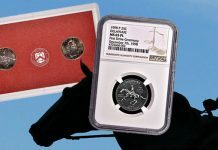 The third era of modern Proof sets began in 1968 with S Mint marks on the Proofs to acknowledge the fact that the numismatic department had effectively moved to the West coast. The sets were offered for sale at $5 each beginning November 1, 1977 for delivery over the course of 1968, and the estimated capacity of some three million sets was reached in May of 1968. Many went to people who remembered how the last Proof set had shot up in 1964, and wanted to speculate in the new ones. There was some grumbling over the fact that this $5 price included an allowance for Registered Mail delivery for each set, to avoid the relatively high number of claims, legitimate or otherwise, that were filed for 1964 Proof sets which seemed to disappear from the Insured Mail, but with no allowance for a reduction in the Registered Mail fee if multiple sets were ordered. 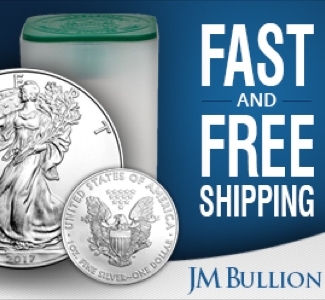 The Mint eventually claimed that the price reflected an average cost of shipping all orders, and that the Mint was actually losing money on the sale of single sets, but nobody took them seriously. I do remember that when the order forms came out I had just $85 to spare to my name, and so I sent in for 17 sets out of the maximum limit of 20. Perhaps because the Mint was filling odd-size orders first (I am guessing) I was extremely lucky to be one of the first persons on the West side of Detroit to receive my sets. They came on a Friday, and I sold them at a coin show that weekend for $13 each and applied the money to my first Quarter’s tuition (a whole $102!!!) at Wayne State University in Detroit. Eventually the speculation broke, and today at Berk’s we sell them for $3.75 each, retail. In November of 1968 the feeding frenzy repeated itself, only this time the three million set limit was reached in six days!! !Once again I lucked out in being among the first ones in Detroit to receive my sets, and I immediately took them downtown to Earl Schill where I traded them for the 1909-SVDB cent I needed to complete my Lincoln collection, plus $120 cash. I believe he allowed me $14.25 per in trade; we now sell them for $3.75 also. All of this worked to generate orders for 3.2 million of the 1970 sets by the Dec. 31, 1969, even though the limit was reduced to five sets per household, which many people got around by ordering through friends and relatives. 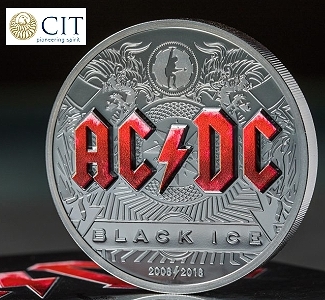 However, after determining that the production capacity for the year would only be some 2.6 million sets, the Mint cut the limit from five to four sets per order and refunded the differences. Then things really got interesting. After the Mint had sent out order forms for a 1970 Proof set containing a 40% silver half dollar and had accepted checks for the same, the Treasury Department decreed that no 40% silver halves would be struck for circulation in 1970. 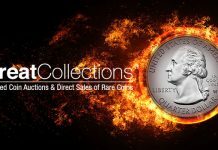 The only way to get a 1970-dated half dollar would be via the Proof sets and the Mint Sets, guaranteeing excessively large sales of these two items for years to come as the speculators waited for lightning to strike again. The 1971 Proof sets are remarkable only for the new copper-nickel alloy in the Half Dollars and the fact that the new Eisenhower Dollar being struck for general circulation was not included in the sets, despite it being offered in 40% silver in Proof and Uncirculated conditions. It is understandable that the regular sets had already been pre-sold before the new denomination was approved, but it is absurd that no Dollar was included in the 1972 sets either. Anybody wanting a complete Proof set of either year had to buy the $5 regular set and the $10 40% silver Proof. 1973 saw a copper-nickel Eisenhower Dollar added to the regular Proof set, but as no Dollars were struck for circulation in 1973 the situation was much like that of the 1970 Half Dollars. 1974 was normal again, and then in 1975 and 1976 the Bicentennial Quarter, Half and Dollar replaced the regular coins in the sets for those two years. 1977 and 1978 were normal again, and then came the Susan B. Anthony Dollar. The 1979 Proof set holders had already been ordered with holes for an Ike-sized Dollar, and so a plastic ring had to be added to support the mini Dollar. A new holder sized for the SBA’s was introduced in 1980, though the coin was struck only for Proof and Mint sets in 1981 and then discontinued. 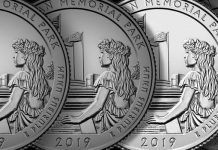 Once again holders had been ordered in advance, and so a U.S. Mint medal was struck to fill the void in the holder. This is the only regular issue U.S. Proof set to contain anything other than a coin in it, though a 1993 American Eagle gold proof set was issued with a silver medal commemorating the 200th anniversary of the opening of the Mint. Things have been fairly calm since 1982, the only set of note being the 1990 set struck without a mint mark on the cent. This repeated an error which occurred in 1968, 1970, 1975 and 1983 on the Dime and in 1971 on the Five Cents, an engraving error supposedly prevented from ever happening again after 1983 by the Mint mark being added to the hubs used to make Proof dies. Nobody has ever explained how this omission occurred. The S-less Cents were even packaged in two different kinds of sets, the regular issue set and the Prestige set which also included a silver Eisenhower’s 100th birthday commemorative. 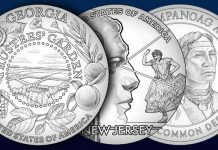 Prestige sets combining regular issue designs with commemorative designs had been invented in 1983 as an additional outlet for the 1984 Olympic silver Dollars, and they have issued in each year since where there were commemorative Half Dollars and/or Silver Dollars. 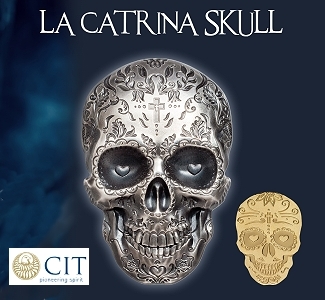 We find that they make great gift items. Another interesting innovation has been the silver Proof sets created in 1992, in which the Dime, Quarter and Half Dollar are made of 90% silver as was last done on the 1964 Kennedy set. Alas, the results have been vastly underwhelming compared to the 1964 sets, and after a year and a half I believe that we still have five sets out of our original order of ten. This is a program which should be discontinued, if bureaucratic inertia can be overcome. The Mint has shown itself to be open to suggestion, and is finally offering sets of the current year in March instead of in July or later. 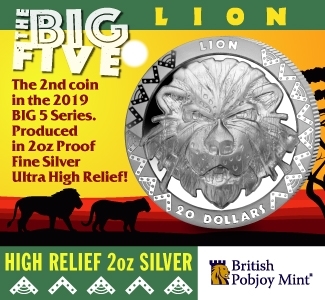 I would like to think that I have had some small part in this change, as I have been telling U.S. Mint officials at ANA conventions for years that the sets make great birthday presents, and that people have birthdays earlier that July.